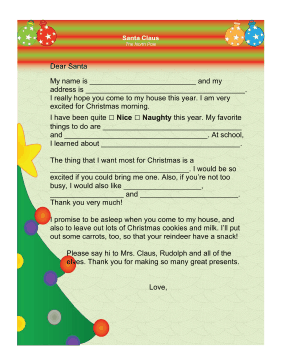 Great for kids who need a little prompting, this printable letter to Santa just needs important information to be entered into the blank spaces. My name is ____________________ and my address is ____________________. I really hope you come to my house this year. I am very excited for Christmas morning. I have been quite _____ Nice _____ Naughty this year. My favorite things to do are ____________________ and ____________________. At school, I learned about ____________________. The thing that I want most for Christmas is a ____________________. I would be so excited if you could bring me one. Also, if you're not too busy, I would also like ____________________, ____________________ and ____________________. Thank you very much! I promise to be asleep when you come to my house, and also to leave out lots of Christmas cookies and milk. I'll put out some carrots, too, so that your reindeer have a snack! Please say hi to Mrs. Claus, Rudolph and all of the elves. Thank you for making so many great presents.